According to the Bankrate.com "Financial Security Index", 40% of Americans have cut back on their spending over the past 60 days, thanks in large part to worries over the state of the economy and a volatile stock market. "In the past 60 days, has the roller-coaster stock market or concerns about the economy caused you to cut back on spending?" The average US consumer have been bashed over the head with a boatload of worrying news and developments over the past couple of months. The debt ceiling debacle. The downgrade of US credit. 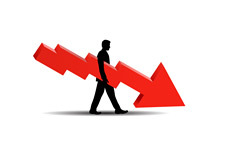 An economic slowdown that has led to worries of another recession. Sky-high deficits. An ever-growing national debt load. A national unemployment rate of over 9%. High energy prices and increasing food prices. The newsflow over the past couple of months has been almost universally negative, so it's not a surprise that consumers would be looking to cut back on their spending. After all, the US public has been bombarded with dire warnings over the state of the economy. According to a number of prominent economists, a "double-dip recession" is practically unavoidable at this point. Many Americans seem to be battening down the hatches and getting ready for another economic storm. The United States desperately needs consumers to start spending again, but it's just not happening, as the 2007-2009 downturn is still fresh in the minds of many.